One way to greet the better weather is to participate in National Rebuilding Together Day. Sometimes it’s bigger than a kitchen sink. Sometimes it’s more than a roof that does not leak. It is about value; Value of the human spirit. It is about community; Community that makes every one in it better. In this video, you will see more of what we mean. Rebuilding Together Muscatine County is in the beginning stages of giving people hope in a different way. We won’t stop doing what we are doing, but we will expand our reach to more of the people who just need a hand up. Would you be a part of this? More details to come. It will be easier when we do it [Re]Build Together. And besides, “It Just Needs Done”. Coming soon, along with Spring, is one of the most exciting times of the year for Rebuilding Together. will come together and make a difference in communities all across America. we still have much to do during the month to prepare. We cannot do what we do without your help. By clicking the link below, you can learn more about Rebuilding Together in general. By clicking the PayPal button on this page, you can donate directly to Rebuilding Together Muscatine County. ALL donations will then stay in our county. Every dollar given to Rebuilding Together Muscatine County, RTMC turns its value into FOUR dollars! Frank was able to join Jordan this week on the program “Moving Forward” at the local radio station, the Voice of Muscatine. “Moving Forward” is a daily program that highlights the happenings of area non-profits. Frank joins Jordan to talk about Rebuilding Together Muscatine County, Inc. Listen in to find out how you can help! Click the link below Frank’s photo to listen in. Formerly the site of Safe Streets in Muscatine, the building at 614 Mulberry Ave. will become a single-family home this year with Rebuilding Together Muscatine County taking on the task of remodeling it. MUSCATINE — Frank Iliff really cares about the Muscatine community, and he enjoys proving it. “I’ve rebuilt it in my mind probably a hundred times,” he said of the property at 614 Mulberry Ave. Rebuilding Together Muscatine County will officially purchase Tuesday from the City of Muscatine. Iliff serves as executive director of the nonprofit and he, along with a crew of volunteers, has plans to convert the former Safe Starts office to a single-family home by mid-to-late summer. Rebuilding Together is a national organization that aims to provide affordable housing for low-income homeowners. It also focuses efforts on rehabbing existing homes to revitalize neighborhoods and allow older homeowners to live at home longer. The group has worked on many projects over the years — about 100 throughout the county — but this is the first home it will take on. “Let’s see how this one turns out,” Iliff said. Turning the 740-square foot former office into a two-bedroom home is no small task. Shelving will be removed, a shower and kitchen sink will be installed and appliances including a refrigerator and stove will be brought in. Volunteers will complete much of the work inside and Iliff said electrical and HVAC system work will have to be contracted. He’s hoping to keep the total cost in the low $20,000s, he said, but because this is the first time the group will tackle a whole home remodel, it may cost more. According to city documents, the building has been vacant since the end of 2017. The city put out a request for a proposal for the property this past summer, but received no responses. A purchase agreement was then negotiated between the nonprofit and the city for $250, with city council approving the purchase at its last session. “It will be a nice little airtight house for somebody,” Iliff said. 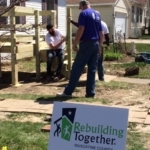 After his experience helping build a porch for an elderly resident in need through a community relations committee at Monsanto, Iliff started the local Rebuilding Together chapter in 2007. He and about 14 other employees tore off the existing structure and built a new one. Iliff said the man was brought to tears by the act. “He said, ‘Frank, no one’s ever done this for me.’” The man had done many things to help the community, he said, and now “it was his turn” to be helped. And since then, the organization has completed projects to make homes safer, especially for elderly residents. Major employers Musco Lighting and Kent Corp. have also partnered with the group on past projects. Work includes building ramps, repairing or constructing porches, installing windows, and electrical and HVAC fixes. “It’s just so rewarding,” Iliff said. In the past, he said he’s requested grant funding from any resources he could find and has received money for the work from Community Foundation of Greater Muscatine, Muscatine Charities, Inc. and local churches. He said he’s looked “any and everywhere” for money to ensure the projects get done. “I haven’t stood downtown with my hat in my hand,” he said, but considering the passion in his voice for the work he does, that might not be off the table. With no formal training, Iliff has been building projects since he was eight years old. He said growing up, every time his family moved, he would be responsible for finding a place to make into a playhouse for his younger sister to “keep her out of mom’s kitchen.” He would clean up and convert old chicken or hog buildings where his sister could take toys make her own play kitchen. He said if his mother was missing a pan, they would always check the playhouse. After retiring from Monsanto in December, Iliff is working for the nonprofit full time. Over the years, he has noticed how the outcomes of fixing up a home are more than the physical work. People build friendships, develop a deeper connection to their neighbors and neighborhoods, and inspire others to look at ways they too can benefit another or the community. He said often times it can be too easy to drive through town, see a yard that needs mowed, a house that needs painting or a roof that needs some shingles replaced and not give it a second thought. Sometimes, the people residing there may need the help, but may not know how to get it. Helping those in need and showing consideration for the community also prevents drug use and crime from creeping into neighborhoods, he said. Frank Iliff had the privilege of dropping off 34 bags of food to the TanTara Transportation Corp. Hawkeye Hauler located at Hy-Vee this week as part of the annual Two Weeks of Love, raising money, food, and awareness for The Salvation Army Muscatine. Members of the RTMC board donated funds to show support for another nonprofit in our community. Serving those in need runs deeply within the Rebuilding Together philosophy, even if it comes in the form of canned goods instead of shingles and ramps. Merry Christmas to all of our friends, volunteers, supporters, and clients. We can’t do what we do without you, and we are grateful. Just because it’s cold outside, it does not mean that the work is has stopped! There is much going on behind the scenes. We are looking for next years projects, and taking care of emergencies as they arise. Rebuilding Together Muscatine County is looking to add some new members for our board. 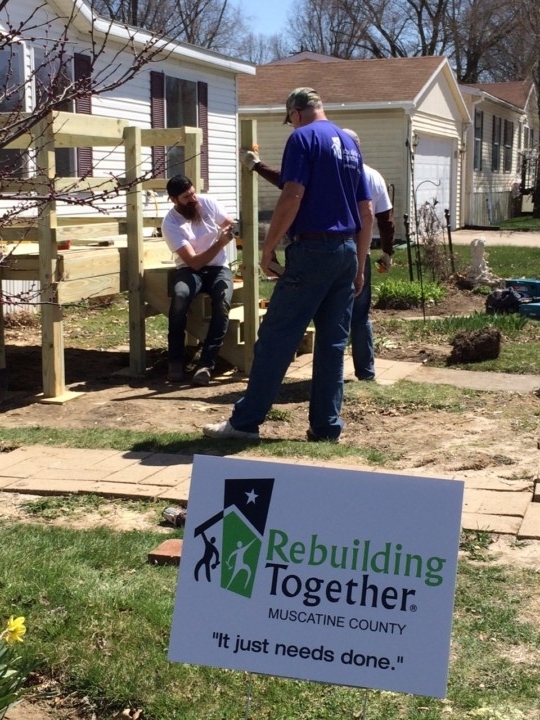 Rebuilding Together Muscatine County is looking for people interested in learning how to build our ramps. We will have a workshop for those who would love to be involved in a “Hands on” sort of way. Rebuilding Together Muscatine County is looking for suitable volunteers to assist our House Captains. This would involve “learning the ropes” to become future House Captains. If you are interested in any of these things, please contact Frank at 563.260.3143.